In 1492, Spain was home to the largest and most distinguished Jewish population in all of Europe. Jews had been living in the area at least since Roman times, and had existed peacefully under Muslim rule – but things changed when the Christians rose to power in the 14th and 15th centuries. The hyper-Catholic Spanish monarchs Ferdinand and Isabella, with the Pope’s blessing of course, made it their business to stomp out heresy within their kingdom. 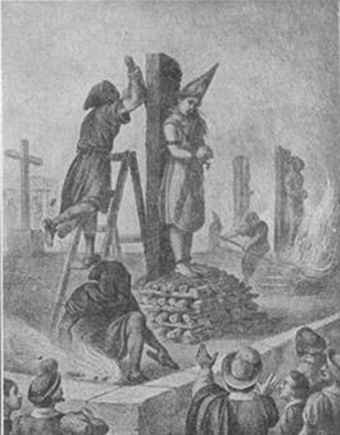 They formed the Spanish Inquisition in 1478 to root out and punish Catholic heretics. But you can’t always catch Catholics misbehaving, so you have to start picking on Muslims and Jews too. By January 1492, the Moors were forced to surrender Granada, the last Muslim stronghold in Spain. Since the Moors were no longer an issue, Inquisitor General Tomas de Torquemada suggested to Ferdinand and Isabella that ousting the Jews so Spain would be an exclusively Christian country would be a good idea. We order all Jews and Jewesses of whatever age they may be, who live, reside, and exist in our said kingdoms and lordships … that by the end of the month of July next of the present year, they depart from all of these our said realms and lordships … under pain that if they do not perform and comply with this command and should be found in our said kingdom and lordships and should in any manner live in them, they incur the penalty of death and the confiscation of all their possessions. The Jews did have another choice besides just leaving – they could choose to convert to Catholicism. Some did, and some of those were later persecuted for secretly practicing Judaism, or for other such reasons. Many other Jews chose exile over abandoning their religion and culture, only to be charged exorbitant amounts of money by opportunistic ship captains, who would often throw them overboard once at sea and steal their possessions. Spaniards would hear that departing Jews had swallowed diamonds and other precious jewels for safekeeping, and gut them in attempts to steal their supposed treasure. The lucky Jews found their way to North Africa, the Netherlands or the New World where they were free to start new lives away from the confines of Catholic Spain. First, there is no such thing as being “hyper-Catholic.” Either one is Catholic or one is not. If one is Catholic, one strives to believe all (and only) what the Church teaches, and one strives to behave according to Jesus’s code of conduct (which is taught by the Church). One who strays from those pathways, whether clergy or layman, is not behaving as a Catholic. Unfortunately, many people who did not adopt the faith of their local ruler got involved in coups-d’etat — and this resulted in overreactions by the rulers (including Fernando and Isabel of Spain). Third, the writer — after brutally accusing “the Pope” of OK-ing the Spanish rulers’ “stomp[ing] out [of] heresy” — totally fails, for the rest of the article, to point out that neither Pope Sixtus IV (whom the writer does not even have the courtesy to name) nor any of his successors ever approved of the excesses of the Spanish Inquisition NOR of the atrocities related in the rest of the article (the Edict of Expulsion, the coerced conversions, the killing of people going into exile, etc.). Dear young and impressionable readers, please do not be misled by anti-religious articles, comments, etc., at this site. Please instead join me in praying for the hate-filled, misguided owners and writers here.